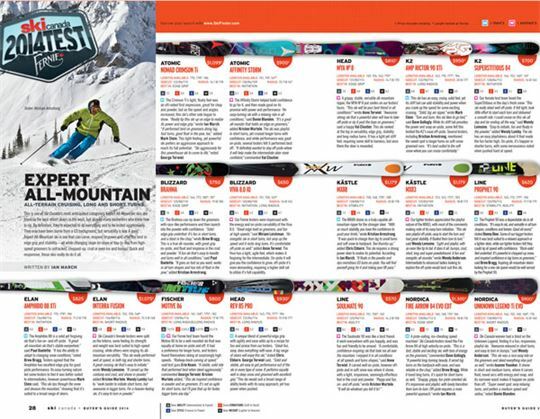 This is one of Ski Canada’s most anticipated categories. Expert All-Mountain skis are loved by the best resort skiers in the west, but also by many easterners who know how to rip. By definition, they’re expected to do everything and to be tested aggressively. They may have been borne from a GS background, but versatility is key. A good Expert All-Mountain ski is one that can carve, respond to power and offer the best in edge grip and stability—all while changing slope-to-slope or day-to-day from high-speed groomers to untracked, chopped-up, crud or even ice and bumps. Quick and responsive, these skis really do do it all. The Crimson Ti’s light, floaty feel was an oft-noted first impression, great for chop and powder, but as the speed and angles increased, this ski’s other side began to show. “Really tip this ski up on edge to realize its power and edge grip,” wrote Ian March. “It performed best on groomers doing big, fast turns; good float in the pow, too,” added Mark Stein. This light-feeling, yet powerful ski prefers an aggressive approach to reach its full potential: “Ski aggressively for this powerhouse ski to come to life,” noted George Terwiel. The Affinity Storm helped build confidence to go for it, and then made good on its promise with power and performance “An easy-turning ski with a relaxing ride in all conditions,” said Donie Blunden. “It’s a good all-rounder that holds an edge on groomers,” added Kristen Wurtele. The ski was playful in short turns, yet cruised longer turns with confidence, and while performance was good on-piste, several testers felt it performed best off. “It definitely wanted to stay off-piste where it will help make the intermediate skier more confident,” commented Val Cloutier. The Brahma can rip down the groomers with race-like performance and then launch into the powder with confidence. “Solid edge grip underfoot. It’s fun in short turns, and a blast in the chop,” wrote Drew Bragg. This is a true all-rounder, with great grip on-piste, and float and response in the crud and powder “A fun ski that’s easy to handle and turns well in all conditions,” said Paul Ouelette. “It goes as fast as you want, works in all turn shapes and has lots of float in the pow,” added Kristian Armstrong. Our Fernie testers were impressed with the energy and on-piste carvability of the Viva 8.0. “Great edge hold on groomers, and fun at high speeds,” said Miriam Leishman. “An energetic ski in short turns, but amp up the speed and it rocks long turns. It’s comfortable off-piste as well,” added Anne Terwiel. The Viva has a light, agile feel, which makes it forgiving for the intermediate. On-piste it will give you the confidence to grow; off-piste it’s more demanding, requiring a higher skill set to utilize it’s full capability. The Amphibio 88 is a solid yet forgiving ski that’s fun on- and off-piste. “A great all-mountain ski that’s stable everywhere,” said Paul Ouelette. “It has the ability to adapt to changing snow conditions,” noted Drew Bragg. Testers agreed that the Amphibio has excellent edge grip for good piste performance. Its easy-turning nature led some testers to feel it was better suited to intermediates, however powerhouse Mark Stein said, “This ski rips through the snow and devours the mountain,” showing that it’s suited to a broad range of skiers. A unique blend of powerful edge grip with agility and ease adds up to a recipe for fun and praise from our testers. “Great fun, easy, does everything with ease. A big range of skiers will enjoy this ski,” stated Chris Ebbern. George Terwiel said, “Solid and stable, yet easy to get performance out of the ski in every type of snow. It performs equally well in deep snow and groomed with excellent grip.” This ski would suit a broad range of ability levels with its easy approach, yet has power when pushed. A grippy, stable, versatile all-mountain ripper, the MYA NO 8 put smiles on our testers’ faces. “This ski will be your best friend in all conditions!” wrote Anne Terwiel. “Awesome strong ski that a powerful skier will love to take off-piste or rip it past the boys on groomers,” said a happy Val Cloutier. This ski ranked at the top in versatility, edge grip, stability and long-radius turns. It has a light yet stiff feel, requiring some skill to harness, but once there the skier is rewarded. Our female test team loved the SuperStitious in the day’s fresh snow “This ski really skied well off-piste. It felt light, took little effort to start each turn and delivered a smooth ride. I could cruise on this ski all day and be smiling all the way,” said Wendy Lemoine. “Easy to initiate, fun and floaty in the powder,” added Wendy Lumby. The ski has an easy playfulness about it that made the fun factor high. On-piste, it’s happier in shorter turns, with some nervousness noted when pushed hard at speed. Our lighter testers appreciated the playful nature of the MX83, with most of the comments making note of its easy turn initiation. “This ski was playful off-piste, easy to start the turn and had great stability. It floated from turn to turn,” said Wendy Lemoine. “Light and playful, with an even flex tip to tail. It does it all: bumps, crud, short, long and super powderhound. A fun and energetic all-rounder,” wrote Wendy Anderson. Intermediate to advanced ladies looking to explore the off-piste would best suit this ski. The Prophet 90 was a dependable ski in all conditions. “It’s easy to ski, and versatile in all turn shapes, conditions and terrain. Good all-round,” stated Donny Dion. Some of our bigger testers felt it was best suited to a relaxed approach or a lighter skier, while our lighter testers felt they could rip at speed with confidence. “Rock-solid feel underfoot. It’s powerful in chopped-up snow, and inspired confidence in big turns on groomers,” said Drew Bragg. Aspiring all-mountain skiers looking for a one-ski quiver would be well served by the Prophet 90. The Soulmate 90 was like a best friend: it went everywhere with you happily, and was fun and friendly to be around. “A comfortable, confidence-inspiring ski that took me all over the mountain. I enjoyed it in all conditions at all speeds and turns shapes,” said Anne Terwiel. It carved well on-piste, however off-piste and in soft snow was where it shone, with a light, responsive, seemingly effortless feel in the crud and powder. “Peppy and fun, on- and off-piste,” wrote Kristen Wurtele. “It will do whatever you tell it to!”. A piste-eating, ice-cheating speed machine! Ski Canada testers loved the Fire Arrow 84 at high velocity on-piste. “This is a fast, stable and exciting ski, with tons of energy on the groomers,” commented Dave Gollogly. “A powerful long-turning beauty. It arced big turns on the hardpack with ease, and was reliable in the chop,” added Drew Bragg. While it loved long turns, it’s quick for short turns as well. “Snappy, grippy, fun piste-oriented ski. It’s responsive and playful, with lovely transition from turn-to-turn. Off-piste requires a more powerful approach,” wrote Ian March. Ski Canada women had a blast on the Unknown Legend, finding it a fun, responsive, playful ski. “Awesome rebound in short turns, and easy to turn in bumps,” said Wendy Anderson. “This ski was a nice easy ride on the groomers and skied everything else just as well,” wrote Joanne Younker. It shone in short and medium turns, where it carves fluid, round arcs with energy and snap, and its narrower waist makes it happier on-piste than off. “Super sweet spot, easy relaxing turns, and prefers a medium speed and radius,” noted Donie Blunden. Testers agreed that the Enduro XT 850 is a truly versatile, all-mountain ski, some even stating that the ski defined this category. “This ski was made for the all-mountain rider, with its good stability on the groomers and great energy off-piste,” commented Dave Gollogly. “It has incredible grip on-piste, and off-piste it enters the turn with ease,” stated Ian March. “A quick, floaty, go-anywhere ski. Rock-solid and fun!” added D’Arcy Sego. Most testers felt those with stronger skills would have the most fun on this ski. Stable, versatile and powerful, the XT 800 is a great all-mountain tool for the stronger skier. “Good in powder, agile and forgiving in bumps. Holds an edge well at speed on groomers,” said Wendy Anderson. 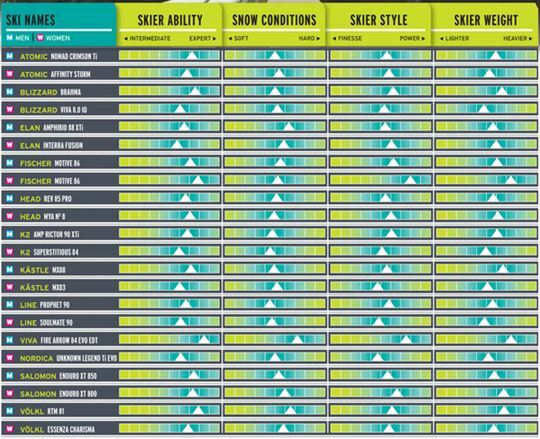 “For the heavier powerful skier who wants to bring the speed up a notch,” added Val Cloutier. A heavier feel to the ski required more effort in short turns and an aggressive approach off-piste, but added to the stability and power in longer turns. “This ski wants to rip! Be ready to go big!” enthused Kristen Wurtele.